The sun is out now and it's a beautiful day, with 16-18 knots of breeze. Dean Barker: "We scraped into the semi-finals, much to our surprise, on a countback. We've come out in completely different conditions and the results have improved. We always enjoy racing against Adam." For the finals: "If we can win three races we'll be pretty happy!" Try the LIVESPORT link or 103FM in New Zealand for listening to commentary by Peter Lester and Harold Bennett on the racing, from 10am NZDT (10pm CET). The same LiveSPORT web-radio channel also has occasional updates on the LIVESPORT TELECOM Women's Match Racing from Sara Roberts at the RNZYS. A 7-8 knot nor'easter is currently holding sway on the Waitemata. Very different conditions - which may see a change in fortunes on the race track. Indeed, this was the case with both matches - a there was a lot of flagging. Wins for Barker and Ainslie at the end. From some mathematical calculations that have produced an interesting result, the semi-finalists have been announced as Ben Ainslie, Dean Barker, Adam Minoprio and Torvar Mirsky. 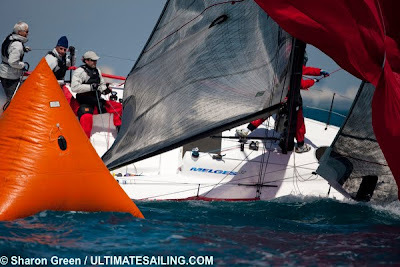 This was calculated on the basis of a full point when sailors have raced each other in both round robins and a half point for a win when they have only sailed each other once. A four-way tie from this in second place, with Barker, Minoprio, Mirsky and Jablonski resolved to leave Minprio in second place, and Minoprio and Barker tied on the same points above Jablonski, who finishes fifth and misses out on the semis. Ainslie chose to race Mirksy, so Minoprio and Barker are racing against each other. Jablonski said: "It's good to be back here again in Auckland. I am very happy to be here, and change winter for summer! "I knew this event would be tough competition, but we have to get used to racing the best in the world. For sure, for me it has been a long time since I raced in the top match racing band. 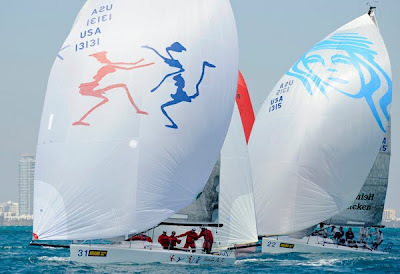 This is the first time for me when I raced on the actual America's Cup boats. We shall see how we end up. "I have Rod Dawson on tactics and main to help with the MRXs. He did a great job in Nice. 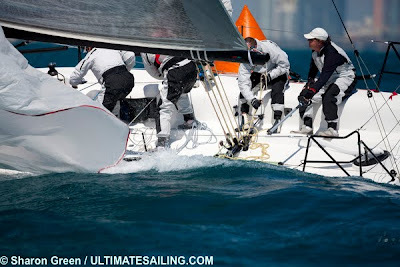 We also sailed together last year in the RC44 in the match race and did really well. We are going to sail on the TP52 as well. "We are very happy with the result we achieved at the Louis Vuitton Trophy in Nice, but here it is going to be a different game - with more breeze and so on." Peter Lester: "What was the highlight of the Winter Olympics for you?" Karol Jablonski: "The cross-country skier who won Gold for Poland, and the ski jumper who won two Silver Medals for Poland. I was trying to follow the ice hockey and was glad that Canada won in the final against the USA. 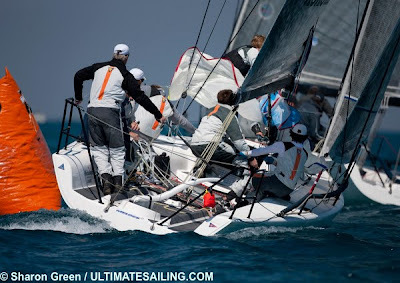 "We will sail RC44 and TP52 in 2010, and will have Chris Main (NZL) on board for the Synergy TP as well." Still waiting for the Principal Race Officer to announce the semi-finalists... in addition to Ben Ainslie. A northwesterly wind that ranged from 7 to 20 knots and shifted as much as 50 degrees during the day forced the boys in the back of the boat to take some risks and hope they guessed right. “The wind was up and down velocity-wise and all over the place on the course. You could easily go from the top of the fleet to the bottom and back again in one race,” Bliksem skipper Pieter Taselaar said. Flash Gordon was among three Farr 40s that handled the shifts and faired well on Friday. 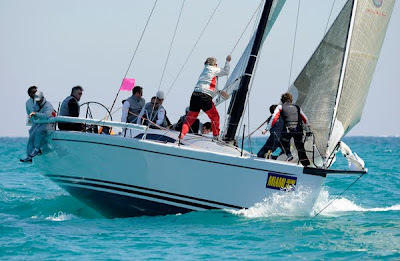 Bill Hardesty did his best to keep skipper Helmut Jahn in the pressure as the Chicago entry posted a second and a fourth to move into third place overall in the 10-boat fleet. It wasn’t a surprise to see tacticians bellying up to the Tiki bar at Monty’s overlooking the waterfront at the Miami Beach Marina. Former Star class world champion Joe Londrigan is trimming the main while Dave Gerber is trimming the jib and spinnaker aboard Flash, which has reunited the crew that was together for the Farr 40 Worlds. Evan Jahn is steering the boat during starts and upwind before handing the wheel to his father. “Helmut has been our rock star. 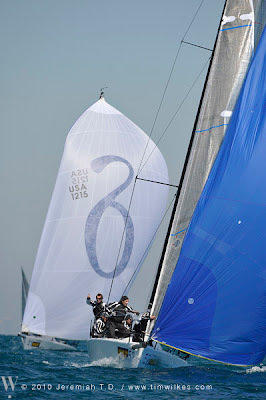 He has been passing boats downwind the entire regatta,” Hardesty said. 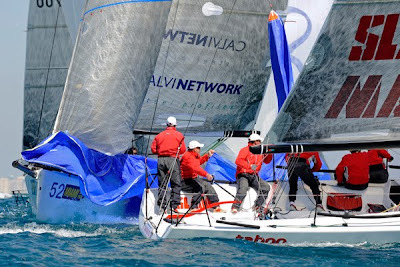 Barking Mad and Fiamma also totaled six points in two starts with a bullet in Race 5 lifting the former into the overall lead by a point over the Italian team. 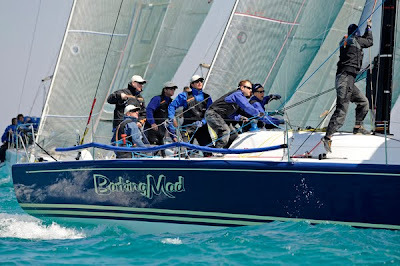 Barking Mad is without three regular crew members, including tactician Terry Hutchinson, due to the Louis Vuitton Series in Auckland, New Zealand. However, up and coming pro Steve Hunt has done a good job of filling in for Hutchinson and skipper Jim Richardson has been pleased with the crew work. 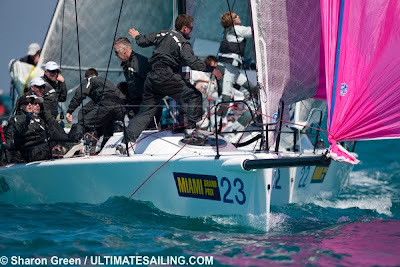 Fiamma, skippered by Alessandro Barnaba of Roma, Italy, posted a pair of thirds on Friday to jump into contention. Tactician Lorenzo Bressani, regular helmsman for the standout Melges 24 program UKA UKA Racing, is calling tactics on Fiamma. Taselaar, a New York City resident, took delivery of a brand new boat on Friday and has outfitted it with new sails. “We are still tweaking the boat and feel we can get more speed out of her,” he said. 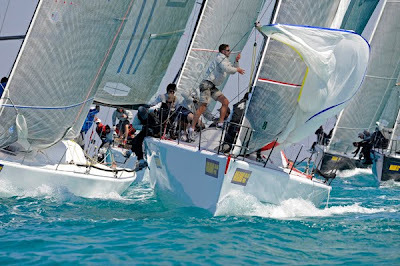 There are five boats within 10 points of the leader in the Melges 32 class, which has attracted 23 entries and features a slew of top-notch pros. Jeff Madrigali is a new addition to the Star team and skipper Jeff Ecklund said his expertise has come in handy so far. “When the wind is as shifty as it’s been so far you really have to keep your head out of the boat. 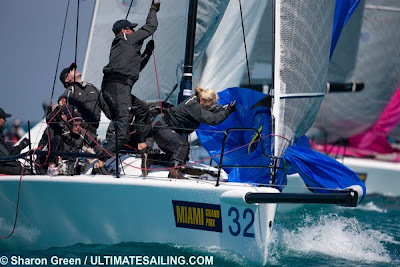 Jeff has been very alert and done a great job of making sure we don’t get caught on the wrong side of the course,” said Ecklund, who has Harry Melges focusing on boat speed. Gold Digger II, a J/44 owned by Jim Bishop of Jamestown, R.I., maintained the lead in IRC class after winning Race 5. 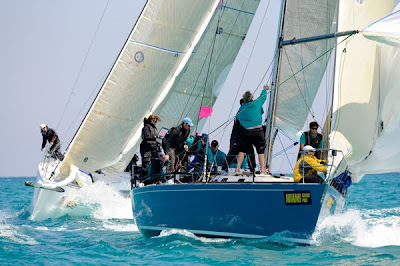 Stark Raving Mad, the J/125 owned by James Madden of Oyster Bay, N.Y., made a move with a second and a third, but remains seven points off the pace set by Gold Digger II. 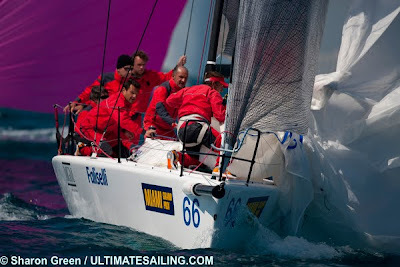 Race Headquarters is at the Miami Beach Marina, the official site and exclusive marina. Mount Gay Rum is the official rum. The Avalon and South Seas Hotels are the Official Host Hotels. Shake-A-Leg Miami is the official charity. No further racing will be held in Round Robin 2 due to the conditions and time running out. 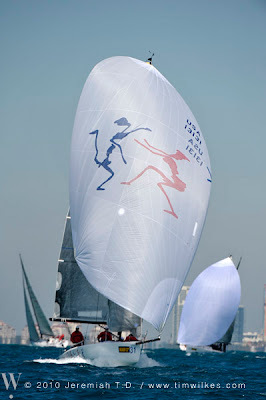 A formula will be applied to decide the other three semi-finalists, in addition to Ben Ainslie. The other three will be determined from: Jablonski, Minoprio, Mirsky, Pacé and Barker. There will be no more racing for at least an hour now. 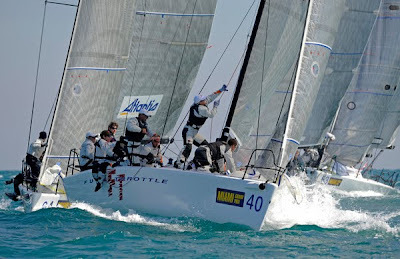 Ross Marwick - PRO for the Omega Auckland Match Racing: "With the noreaster coming through, Clouds [Roger Badham, ETNZ's weatherman] thinks that the southerly that was due to come through will go back to Manakau, and the noreaster will stay on the Waitemata. "Racing will have to be under way before 2pm in order to run semis as well as the finals and petit-final, otherwise we will go straight to the finals and petit-final." Chris Dickson is sailing with Emirates Team New Zealand crew here. Magnus Holmberg is higher and faster off the line on port against Pacé, which is what Dickson did to Barker. It is something of a one-track course at present. Ainslie won the left off the start and, like with the other matches, got into the first left-hand shift, then heads across the river current and over to the wall by the Squadron where there is less current, and so up to the windward mark. It's still light and tricky! Grant Dalton has confirmed that if there is a two-boat campaign for the 34th America's Cup, Adam Minoprio, from BlackMatch Racing, will be offered the helm of the B boat for Emirates Team New Zealand. 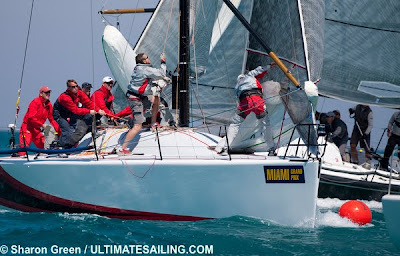 Minoprio and Barker have trained against each other for the Omega Auckland Match Racing. The Emirates Team NZ TP52 has been modified recently and will be shipped to Europe at the beginning of next week. TeamOrigin's TP52 (designed by Juan K) is currently being finished off at Cookson's in Auckland. 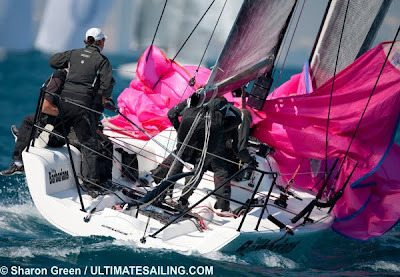 Prada are the third America's Cup team taking part in the TP52 circuit in Europe this year. Bill Edgerton will be Chief Umpire for the Louis Vuitton Trophy Auckland next week, and was the Chief Umpire in the 33rd America's Cup held in Valencia last month. 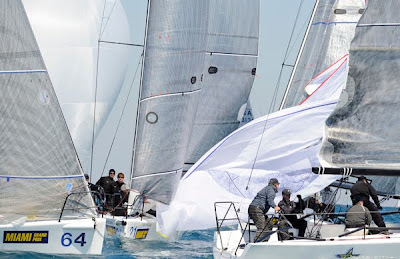 He commented to Peter Lester on LiveSPORT today that everyone was surprised about the penalties in Valencia, as the boats had not been expected to engage to the extent of a dial-up in Race One, a hook in the pre-start in Race 2 and a major cross near the windward mark. 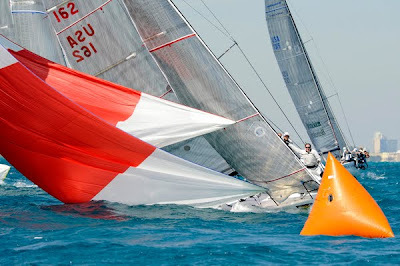 The fact that a penalty occurred in the first coming together in the 33rd America's Cup was even more unexpected, let alone that in the second pre-start when Alinghi 5 was not outside her end (the starboard side) of the startline in time prior to the lead-up to the pre-start entry, Edgerton told Lester. Dalton also confirmed earlier that there was no news as to the new America's Cup boat, but said that he would probably be equally happy with either a monohull or multihull, although he pointed out that Emirates Team NZ was more set up for a monohull event, being the leading team in that size and type of boat recently. Dalton also said that he hoped the B boat would return, which would help with testing and training, and indicated that this seemed to be something that Coutts would likely agree with. At 11.10am the wind has still not settled. 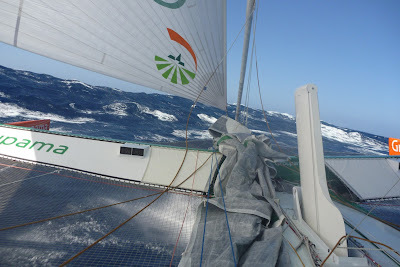 The forecast is for the wind to pick up, probably at lunchtime, and maybe reaching 20 knots by the evening. Harold Bennett reports that the race committee seem to be setting a course up now. The cloud is going and more and more blue sky is appearing, it's warming up, and the indications for racing are altogether more positive. Part-way through the pre-start between Barker and Dickson, the second match was called off, due to a massive windshift. Mirsky won the first match comfortably against Jablonksi. The same windshift that affected the pre-start of the Barker v. Dickson match turned the Mirsky v. Jablonski match's first run into a reach. 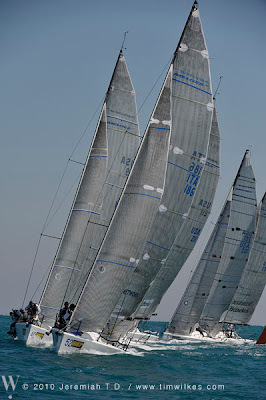 A subsequent change of course rectified the situation to the best of the race committee's ability in the light and variable conditions. The race committee are re-locating and then a new course will be set up, but winds are still light and variable. Racing has started, as of 9.45am NZDT, with Jablonski (POL) and Mirsky (AUS) in the pre-start of their match - the first in the part-complete Flight 7 in Round Robin 2. The Shark against the World #2: should be a good match! 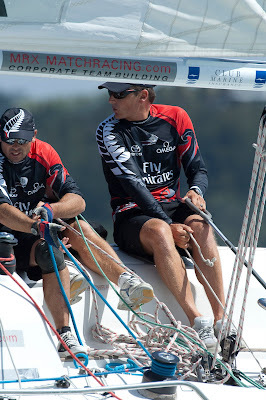 Dean Barker at the helm for Emirates Team New Zealand. Image copyright Chris Cameron/ETNZ. Northerly vespers barely registering a wind speed - definitely not enough for racing, so it's a good thing that they weren't planning to start at 7.40am NZDT! Racing in Round Robin 2 Flight 7 will be under way by 10am, provided that conditions are good enough to permit this. MetService says light southeasterly winds, 4-6km/h strengthening during the day as a trough approaches; showers developing later, with a high of 26C. The marine forecast has 20 knots of breeze. MetVUW also predicts more wind - around 10-15 knots. 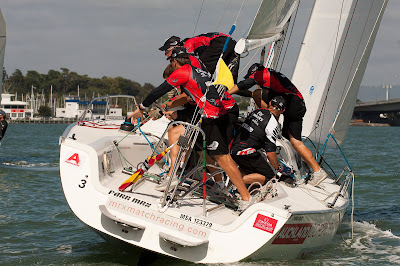 Emirates Team New Zealand tacking. Image copyright Chris Cameron/ETNZ. Courses will be laid off the Westhaven breakwater. A grandstand erected near the Royal New Zealand Yacht Squadron provides a great view of the entire course. After three days of racing, MRT are still in the hunt for a semi final spot with 8 wins and three races to go. 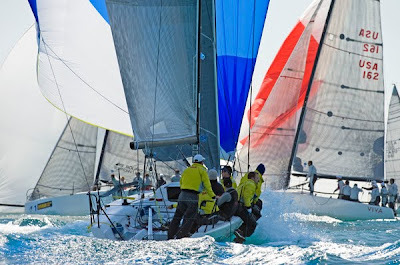 The organisers were kept on their toes as Auckland produced fluky conditions which persisted throughout the day. The day kicked off with a solid race against Team Azzura’s Francesco Bruni. MRT managed to slide ahead of the Italian team off the starting line, and with Tom Slingsby creating a near flawless race strategy, they managed to extend their lead comfortably. MRT are tied on 8 wins along with Emirates Team New Zealand’s Dean Barker and Team Aleph’s Bertrand Pacé of France, so tomorrow, every race counts. The first race of the day will be against Team Synergy Russia’s Karol Jablonski who is one point ahead of MRT. 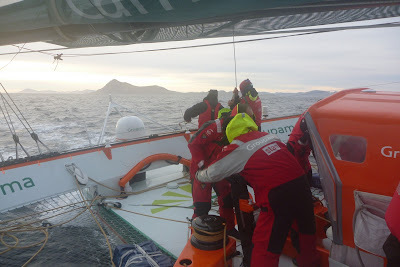 Cape Horn from Groupama 3. 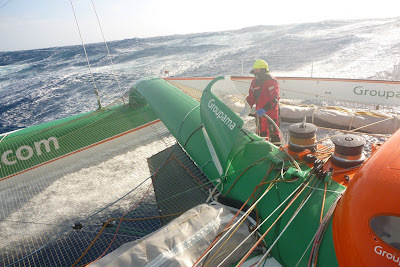 Image copyright Team Groupama. 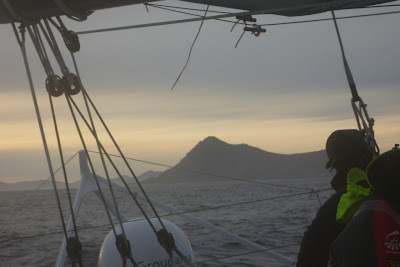 A few hours before Cape Horn. Image copyright Team Groupama. 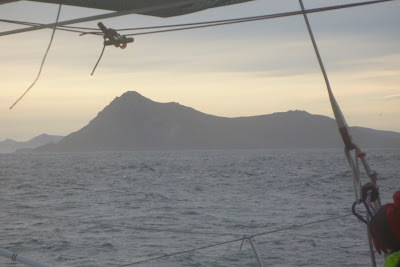 A few hours before Cape Horn: Jacques Caraës. Image copyright Team Groupama. 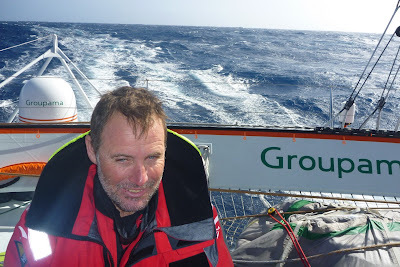 A few hours before Cape Horn: Bruno Jeanjean. Image copyright Team Groupama. 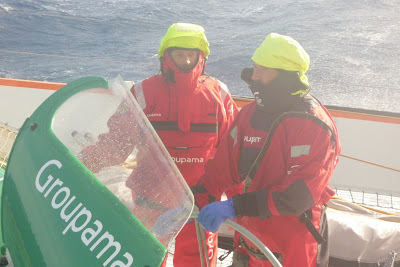 A few hours before Cape Horn: Stève Ravussin and Bruno Jeanjean. Image copyright Team Groupama. 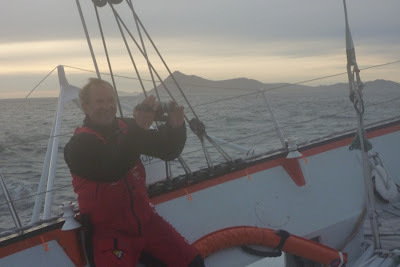 A few hours before Cape Horn: Loïc Le Mignon. Image copyright Team Groupama. 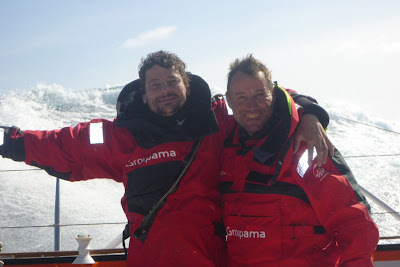 A few hours before Cape Horn: Loïc Le Mignon et Fred Le Peutrec. Image copyright Team Groupama. 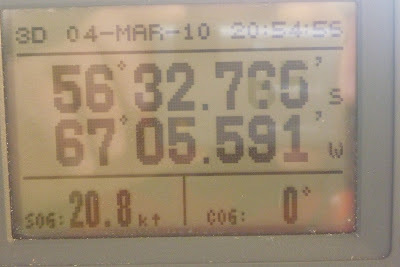 Off Cape Horn: the evidence! Image copyright Team Groupama. 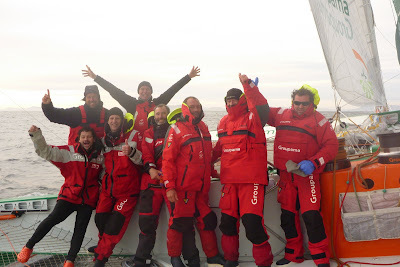 Most of the team on deck - passing Cape Horn. Image copyright Team Groupama. 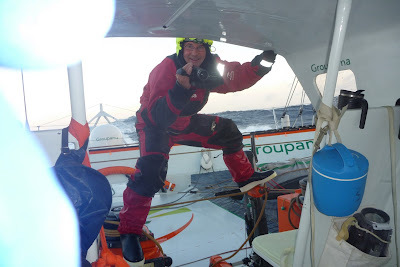 Off Cape Horn: Bruno Jeanjean. Image copyright Team Groupama. Sailing the boat, off Cape Horn. 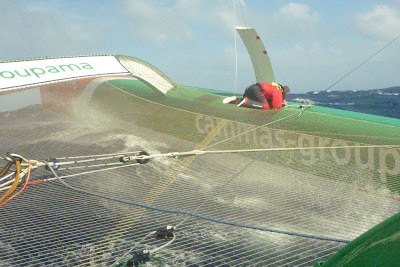 Image copyright Team Groupama. Off Cape Horn: Jacques Caraës. Image copyright Team Groupama. 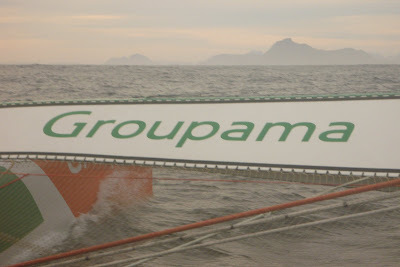 Groupama 3 off Cape Horn. Image copyright Team Groupama. The Longtze Student Cup: a first! 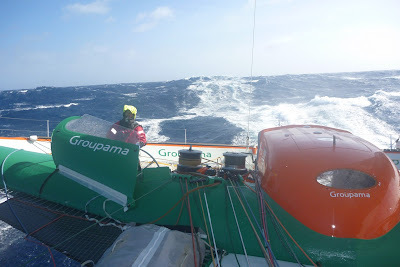 JVT: Cold ahead for Groupama 3!